Some pet owners are keeping these thieves away by filling Amazon and other boxes with dog poop, and then placing them on their porches. As Eric Bardo of Las Vegas was picking up after his big dog last year, he got the idea to put the poop in a Priority Mail box and leave it on his porch. Four days later, a young thief took the B.M. bait. Surveillance cameras captured videos of a boy snatching the poop package and then running down the street with an accomplice. Apparently Bardo was a turd trendsetter. This year another Vegas resident, Eric Snow, did the same thing after packages were being stolen in his neighborhood. He filled a box with what he called “reprocessed dog chow” from his 95-pound German shepherd, Heidi, and put it on his front porch. 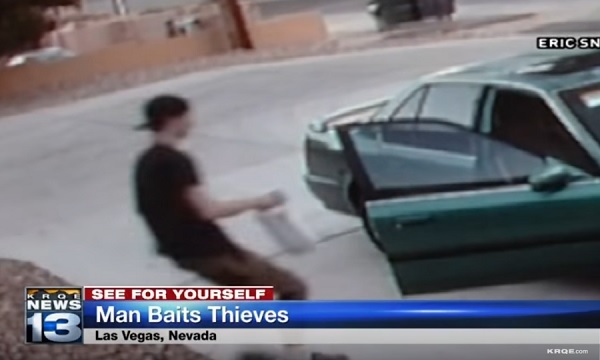 A security camera showed two men pulling up in a green car and snatching the nasty package. Earlier this month in Riverside, Calif., Mikey Zaremba filled a box with poop collected during his Great Dane’s birthday party with several other dogs. Just like those Vegas dog dads, he left it on his front porch. As you can imagine, Daniel Aldama, the thief who stole the package, got a really big surprise. “He dropped it as soon as he found out,” Ronel Newton of the Riverside Police Department told CBS Los Angeles. “He didn’t want nothing to do with it and kept on riding.” Aldama was arrested and is facing charges. If leaving your pet’s poop in a box on your porch doesn’t appeal to you, here are some other steps you can take to avoid having your packages stolen. For FedEx deliveries, you can request a signature, schedule a delivery or have the package sent elsewhere, such as to your office or to a family member or neighbor who’s home during the day.